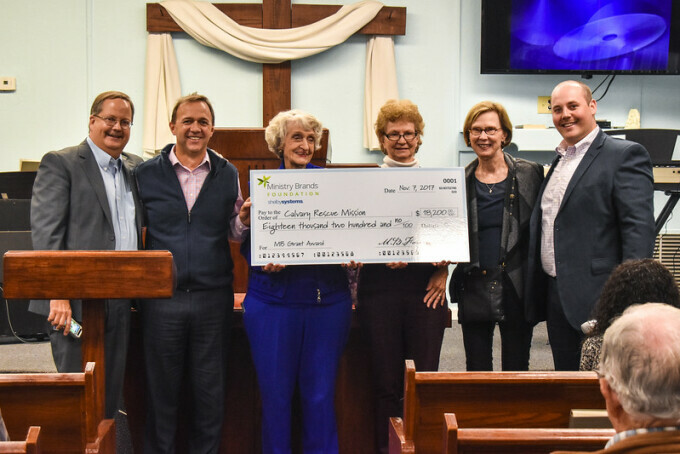 Representatives of the Ministry Brands Foundation recently presented a grant for $18,200 to officials with Calvary Rescue Mission that will go to fund a computer lab in the Mission’s new facility near downtown Memphis. Calvary plans to use the computer lab to help residents of the mission with training and education which includes helping many of its residents get their GED. In addition, the new 15,500-square-foot facility will allow the mission to expand its housing capacity to 112 homeless men a night. “In the neighborhood Calvary serves, one in nine are a victim of a violent crime, yet every night the Gospel of Jesus Christ is preached, a meal is served, and a bed is provided for about four dozen that do not have a place to call home,” said Steele Billings, Ministry Brands Foundation Selection Committee member. Started by the late Milton Hatcher and his wife, Betty, Calvary Rescue Mission opened its doors on April 1, 1967 to provide temporary shelter, food, and clothing to homeless men in need. In addition, they offer nightly chapel services, counseling, a discipleship program and a library. The grant was one of seven given out to worthy charities around the country this fall by the Foundation. The Ministry Brands Foundation was established in April 2017 to “propel Christian ministries to fulfill their work with relevance for today’s culture.” The Foundation is the charitable arm of Ministry Brands, LLC. based in Lenoir City, Tenn., a leading software provider for churches and non-profits across the country. Grants are awarded seasonally, based on four concentration areas: Youth & Young Adults, Church & Technology, Hunger & Homelessness and Biblical Literacy. Funding from the grants is used for capital improvements, projects and programs of qualifying 501(c) 3 organizations selected from Ministry Brands’ customer base. We recently announced our first round of winners. We'll be sharing their stories here. But first a quick overview! It's so exciting to see a plan come together and we're honored and thrilled to join the great ministry work going on with our new partners. Read more below! Right from them: "Our annual mission trips are powerful ways for our youth to use their gifts for the betterment of others. We send high schoolers to Nazareth Farm, West Virginia to rehab housing in four poverty-stricken counties. Our middle schoolers serve those in need through soup kitchens, senior centers, and child care facilities in the inner city or Kansas City." We're so excited to partner with them and we can't wait to hear more stories from the front lines! They are reaching out to parents and children in our community to bring them closer to the church, closer to God and help them to understand the sacraments. In their own words: "The Edge and Life Teen program. These programs will engage our youth in the spirit and life of God. It will teach the youth to be stronger in their faith and fall in love with God. The programs include parent night and family night that will help them grow in their faith and spirituality both individually and as a family." We're so excited to be a part of the hunger for learning and becoming closer to their faith and these programs will be a start. Also in their own words: "We will be serving the teenagers of our community! They are youth with vibrancy, lots of energy, imagine a whole high school worshipping Jesus! Our youth ministry has made a huge impact on our community the past 12 years. We reach students from all types of backgrounds for Christ. We bus students in from all over our city and we love seeing students make the decision to live for Jesus!" Sendero will be sponsoring a youth event offering students a lot of fun while also providing them with that one thing that will change their life forever. Ministry Brands is humbled to be small part of what they are all about. Dozens have already been impacted, but hundreds will be impacted as we minister weekly to our Good News Club. New Journey Fellowship has been operating a bus ministry for the past 4 years. Our need is for a vehicle, a 15 seat extended passenger van. We have conducted a Good News Club at Skyview Elementary for 3 years and we have had between 40 to 60 children each Friday afternoonâ€¦many of these children accepted Christ as their Savior but the families do not attend church. God provided a bus from another church that we have borrowed each week. We reached out to the Good News families (invites/permission slips) and began running a weekly bus ministry to bring children to Sunday school and church. We have done this with the intent to reach entire families for Christ. God has been good to us as we have seen many children saved and parents reached as well. In their own words: "We have conducted a Good News Club at Skyview Elementary for 3 years. we have had between 40 to 60 children each Friday afternoon, many of these children accepted Christ as their Savior but the families do not attend church. God has been good to us as we have seen many children saved and parents reached as well. The time has come to replace that bus and the Ministry Brands Foundation is glad to be a part of this! Founded in 1994, the Christian Youth Film Society encourages and equips young people to create excellent visual stories of faith. Through highly interactive Workshops and Film Camps, youth ages 12-22 will learn all aspects of film making from accomplished film professionals. Young film makers from across North America enter short movies into the gala Film Festival for encouragement, recognition, and prizes. In order to encourage growth in the Festival and provide an appropriate venue, the Festival is planning to add another evening; specifically for college age film makers. The Christian Youth Film Society will add another evening to the existing festival specifically for the College Division in the same venue. We can't wait to see what they come up with! Straight from Vida Nueva: "We truly believe that there are young men and women who will experience a life-changing encounter with Father God who would not have been able to without your generous grant." Vida Nueva is Spanish for "new life" and is a weekend encounter with Christ for young adults between the ages of 15 and 20. Vida Nueva helps young people who were at the point of contemplating taking their own life and helps them find hope and purpose through the love of the Father they experienced on their weekend. Many have been called into ministry through their time either as a candidate or in serving as a team member. There's nothing so great as watching the way our God works in the lives of all the people involved and all these great ministries! Applications are just closing for the second round of funding and it truly is great to watch this process unfold. At the Ministry Brands Foundation, we exist to support innovative solutions to key challenges in our global, Christian communities.